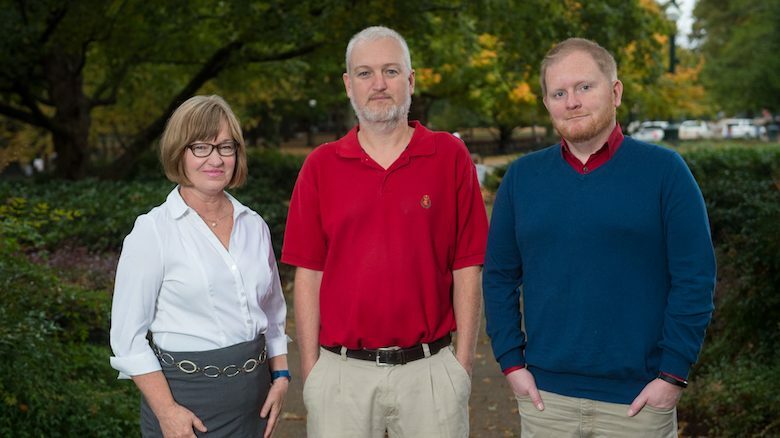 Three University of Mississippi faculty members have earned a national award from Online Learning Consortium for advancing student success through adoption of digital courseware. Their work is having an impact across introductory writing courses and producing direct cost savings for students. Karen Forgette, Andrew Davis and Guy Krueger won the OLC Digital Learning Innovation Award for their project, “Addressing Access, Assessment and College Readiness Gaps in First-Year Composition: Personalized Open Educational Resources Courseware Modules at the University of Mississippi.” The honor includes a $10,000 stipend. The UM team, in collaboration with Lumen Learning, applied principles of OER to develop and implement customized, low-cost, modular courseware in first-year writing curricula. The courseware addresses student preparation gaps in foundational content knowledge and rhetorical skills, areas often under-assessed in writing classes. To overcome the limitations of generalized, pre-packaged course material restricted by traditional copyright, the trio adapted open content to their own institutional context. This approach produced courseware that’s relevant, engaging and connected to the needs and experience of UM faculty and students. Survey results following the fall 2017 pilot of roughly 1,000 students revealed that 68.5 percent felt the courseware contributed to their success on major writing projects. Data also revealed that students used the courseware in various ways without being prompted, indicating the platform is versatile enough to accommodate individual student needs. The open courseware has substantially reduced textbooks costs for students. After the team’s success with the pilot, the courseware has been implemented programwide for the fall 2018 semester and is being used by at least two other schools. “Andrew Davis, Karen Forgette and Guy Krueger are innovative teachers who think first and foremost about their students,” said Stephen Monroe, chair of the Department of Writing and Rhetoric. “With the support of PLATO, a UM program funded by the Association of Public and Land-grant Universities and the Bill and Melinda Gates Foundation, this incredible team has developed low-cost digital modules that personalize learning for UM students. The trio was presented the award and recognized at a ceremony Nov. 13 in Orlando, Florida. “The OLC Award for Digital Learning Innovation by a faculty team is a testament to the successful combination of collaborative course revision for multiple sections, low cost/high impact digital learning tools and a department-level commitment to continual improvement,” said Patti O’Sullivan, PLATO program director. Lee M. Cohen, dean of the university’s College of Liberal Arts, agreed.